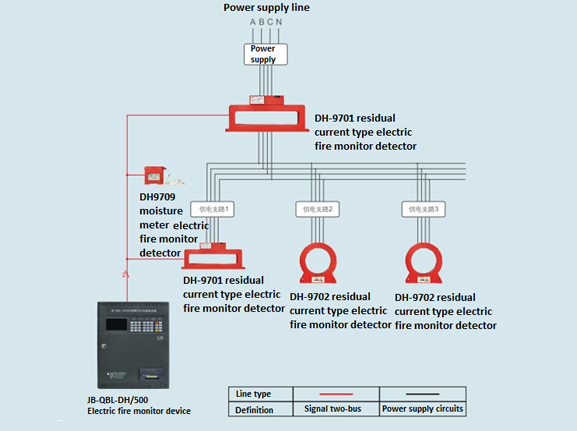 DH500 electronic fire monitor system is our new generation of electronic fire monitor device, which can work with SANJIANG other products to compose of electronic fire monitor system flexibly, and can keep the electricity safety and prevent electronic fire from happening. This surveillance device is widely used in hazardous things place, high-rise building, public place and residence etc. ‍‍With new generation of high speed micro programming, the speed of data processing has improved 100 times compared to traditional technology, and the data storage capacity has improved 100 times as well. ‍n With standard panel and keyboard, USB computer keyboard, and mouse for on-site programming. ‍n With non-polarity two-wire bus, and one monitor device can connect up to 324 monitor detector. The addresses of remaining current monitor detector or temperature monitor detector can be mixed coding, 1-324# optional. ‍n System operation historical recording function: historical alarming, historical faults, historical linkage, historical operation has 1000 messages separately. ‍n Support manual single point start/stop function, which is convenient for commissioning. ‍n Equipped with micro printer (hereinafter referred to as printer), which can print system alarm, starting, feedback, faults messages etc. at real time. ‍n Can realize urban networking by connecting with PC. ‍n System support multiple classes users, different class users have different operation limitation, which is convenient for system management. ‍n The system software can be upgraded on-site, and promise the system can work stably and reliably.